Cook pasta in boiling salted water with a dash of salt. Once it is cooked as per your preference, strain it and set aside. Reserve 1/4 Cup of boiled pasta water. Reserve 1/4 Cup of boiled pasta water. Set aside to use later. Saute garlic and red chili flakes for a minute. Add the pumpkin puree, pasta sauce, seasoning, salt and the reserved boiled pasta water. Stir to combine. Allow the sauce to simmer over low heat for 5 minutes before adding the pasta. Meanwhile, preheat the oven to 180 degrees C. Grease a 9-inch square/rectangle baking dish with a tablespoon of oil. Add the boiled pasta in the sauce. Mix nicely to evenly coat the pasta with the sauce. Transfer the pasta to the greased baking dish. Cover it with grated cheese and pizza cheese slices. 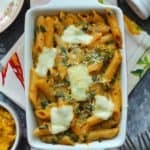 Bake in the oven for 10 minutes or till cheese melts and form a crust on top of the pasta. Serve Pumpkin Pasta warm with the toasted bread slice.